In this episode, we discuss the foundations of evidence based thinking, the important balance between Habits and Decisions and how each of them shapes who you ultimately become and dig into the idea that your decisions set the trajectory of your life, but your habits determine how far you walk on that journey, from there we explore how to build high impact habits, what you need to do to determine the best habits to focus on first, how you can harness the the power of the “aggregation of marginal gains,” and much more with our guest James Clear. James Clear is an american author, entrepreneur, and photographer. 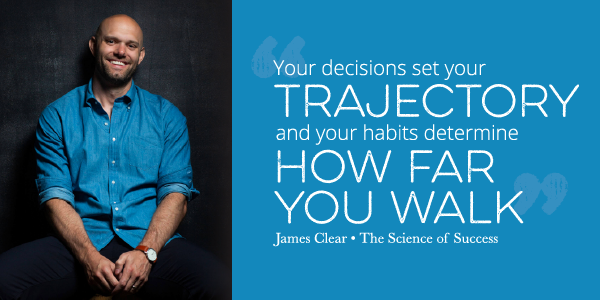 His personal blog, jamesclear.com has over 400,000 email subscribers and his first book Atomic Habits is set to release in October this year. His work focuses primarily on habits and human potential looking to answer the question “How can we live better?” by focusing on science-backed methods. James’s work has been featured in The New York Times, CBS, Forbes, and more. “Habits are the compound interest of self improvement"
"The plateau of latent potential" - early in the curve it feels like you’re stuck on the plateau, then suddenly huge changes start happening. That work is NOT BEING WASTED - it’s JUST BEING STORED. Hacks, shortcuts, rapid or quick results are usually an illusion. “Overnight success is like an earthquake” - two plates grind against each other for years and suddenly there is an earthquake. You have to put in a long amount of work before the “energy” of performance is “released." How do we determine which habits have the highest potential for growth / impact? What results do those habits create, when compounded? How do those habits impact your identity and self perception? Does this habit contribute towards the identity you Want To Have? Your actions become evidence for the type of person that you believe that you are. True behavior change is identity change. Once you change your identity it doesn’t feel like work anymore. It’s NEVER the first mistake that ruins you - its the spiral of mistakes that follows it. Get back on track. You’re not even looking to be perfect, its about slowly stacking marginal improvements. Instead of quitting your diet because of bad meal - what if you just ate one healthier meal per week? Habits shape what you pay attention to. A few decisive moments can have a huge impact on how you spend your time. Focus on mastering a few decisive moments that end up shaping how you spend your time - and make those moments as easy as possible. If you enjoy learning these incredibly important skills, Brilliant is offering THE FIRST 200 Science of Success listeners 20% off their Annual Premium Subscription. Simply go tobrilliant.org/scienceofsuccess to claim your discount! [00:00:11] MB: Welcome to the Science of Success, the number one evidence-based growth podcast on the internet with more than 2 million downloads, listeners in over a hundred countries, and part of the Self-Help for Smart People Podcast Network. In this episode, we discuss the foundations of evidence-based thinking, the important balance between habits and decisions and help each of them shapes who you ultimately become. We dig into the idea that your decisions set the trajectory of your life, but your habits determine how far you walk on that journey. From there, we explore how to build high-impact habits. What you need to do to determine the best habits to focus on first? How you can harness the power of the aggregation of marginal gains and much more with our guest, James Clear. There's some amazing stuff that's available only to email subscribers that's only going on if you subscribe and sign up to the email list. You can do that by going to successpodcast.com and signing up right on the homepage. Or, if you're driving around right now, if you're out and about and you're on the go, you don't have time, just text the word “smarter" to the number 44222. That's S-M-A-R-T-E-R to the number 44222. In our previous episode, we discussed how to become a high-performer at work. We looked at one simple question you can use to double your productivity. We talked about how to decipher scientific evidence and determine what's really important to focus on for maximum performance. We examined how to get quality feedback on your work, shared strategies for creating high-performance habits and behaviors, and uncovered what it takes to quickly improve your performance with our guest, Mark Effron. If you want to double your focus and productivity, listen to that episode. Now, for interview with James. [00:03:02] MB: Today, we have another great guest on the show, James Clear. James is an American author, entrepreneur and photographer. His personal blog, jamesclear.com, has over 400,000 email subscribers and his first book; Atomic Habits, is set to release in October of this year. His work focuses primarily on habits and human potential looking to answer the question; How can we live better by focusing on science-backed methods? His work has been featured in the New York Times, CBS, Forbes, and much more. James, welcome to The Science of Success. [00:03:33] JC: Thanks so much for having me. It’s great to be here. [00:03:35] MB: We’re super excited to have you on the show today, and I’d love to start out with – It's something obviously we’re big fans of, but it's great to have kind of another member of the sort of evidence-based growth tribe on the show. How did you kind of begin down that journey of really looking at focusing on kind of the science behind what makes people perform and what makes people kind of live better lives? [00:03:58] JC: Yeah, it’s a good question. I think it’s something you realize as you grow into adulthood is that there's no real playbook. Everybody is just kind of like operating on their best guess and trying to do the best they can at the time. So my question as I started to except that truth was, “Well, how can I have better guesses? How can I try to hone in on and optimize the strategies that I'm using?” and science, at least thus far, is the best tool or strategy that we have for making better guesses and for kind of honing in on what works. I think there are kind of like two ideas that you have to hold simultaneously. The first is that science and scientific research is the best tool that we have for figuring out what works across a broad range of cases. So in other words, what is true or what is accurate in many different circumstances for a given a topic, rather than just based on like an individual’s opinion or one particular case, or one particular circumstance. But then at the same time you have to hold this idea that you really need to, if you’re going to be someone who is not just a – Like a reader or a researcher of science, but also a practitioner of those ideas, then you have to be willing to accept the fact that you are not the average. You are just you, an individual and of one, and in order to implement any of those ideas, you have to adopt this philosophy of self-experimentation. So it's quite possible that a research study will come up with a finding that says the average is X and you in fact are Y or Z or something totally different. One of my favorite examples of this is like the average American family has something like 2.3 kids or something like that. But, of course, there is no single family that actually has to 2.3 kids. It’s impossible to have .3 of a child. So my point here is that you both need to trust the science and trust the evidence that is the best method we have to kind of guide your actions, yet still be willing to go through the trials and the trial and error yourself to try to figure out what works in your individual circumstance. To me, it's kind of those two ideas that combine what it means to be an evidence-based practitioner, which is something that I strive to do in my work. I mean, it’s very easy to have an opinion and just write about ideas. It’s hard enough work to have a good opinion, to have something that’s research-backed. But I'm very weary of like being a new age version of someone in the Ivory Tower and just writing about ideas. That’s why I do travel photography around the world. That’s why I’m a weightlifter and compete, and it’s why that I publish my work and share it publicly so that I can kind of be tested by readers and the audience at large. I feel like all those little ways are kind of methods for me to have my own skin in the game and figure out what actually works for me and not just share some thoughts. [00:07:14] JC: Yeah, I would agree with that. I mean, I think is very hard to step outside of your own experience, and most of the time we don't realize that the vast majority of our opinions are simply those that have been reinforced through whatever this version of life is that we’ve lived. You have like personal evidence for your beliefs, which is the history of experiences that you’ve had in your life. So if things have happened two or three times, that seems like a fairly relevant bit of evidence for why you should believe a particular thing. Of course, two or three instances in the grand scheme of the world was basically nothing. So science gives us a way to kind of look at a thousand or 10,000 instances of a particular topic or issue and maybe hone in on something that’s a little more robust and accurate. [00:07:57] MB: Yeah, that's something I feel I encounter again and again is kind of people who sort of overweight their personal experience and underweight the science or kind of the broader research. [00:08:09] JC: It’s hard, because you kind of have to do both. You don't want overweight any single instance and yet at the same time, like I just mentioned, you need to be willing to realize that ultimately you're trying to figure out what works for you. So you have to trust your experience or that something might be slightly different than the average of a particular study or whatever. [inaudible 00:08:29]. That’s a hard balance to strike, but I do think that being informed by science and evidence is a much better way to go about the process of self-improvement than merely guessing. Basically, anyone of us could be a billion different things. You could live an infinite number of different lives, but only one of those is actually lived out. You only follow one of those paths. So how do you decide which one it is? So it's not possible for any person, any individual to take all billion guesses throughout their life, and science gives you a way of like whittling that number down and being able to focus on taking gases that are more sounds, more likely to succeed, and hopefully more useful for you. [00:09:09] MB: I think that kind of fundamentally underscores why decision-making is such a critical skillset. I mean, we talk about it all the time on our show and I know you've written and spoken about it as well. But it's such a valuable tool, because life at the end of the day is just sort of a series of decision after decision after decision. [00:09:29] JC: Yeah. I like to say that your decisions set your trajectory and your habits determine how far you walk along that trajectory, how far you move along that path. The benefit of making a good initial decision could be like solid, but the benefit of making an excellent initial decision could be orders of magnitude better. Just classic example is like choosing an idea to start a business around. One idea might get you a 10X return, but another idea might get you a 10,000X return. You're going to be working hard each day on either business, but the initial choice sets you on a completely different path. So this is true for your habits and daily routines as well, but the differences is once you make that initialization decision, it’s your habits and the fundamentals that you stick to day after day determine how far you move along that path. Someone could have a business idea that could generated a 10,000X return, but if they don't develop the habit of making sales calls every day, for example, then they don't actually realize that potential. So decision-making creates leverage habits, capture it. I think especially in our world, our modern world, and this has only been true the last 100, or 200, maybe 500 years, we have created systems of leverage that are greater than any that have existed thus far in human history. So coding and programming the internet creates almost infinite leverage and scale for you to reach the rest of the world. Capitalism and investing and compound interest, I mean, all of these things are forms of leverage, and so your initial decision dramatically increases or decreases the return that you could have, but your habits determine whether or not you capture that return. [00:11:06] MB: I love how simply you’ve kind of married the sort of dual schools of decision-making and habit creation, because that's a great and really kind of thoughtful way of connecting those two things together meaningfully. [00:11:19] JC: I think they’re two of the pillars of living a great life. If you can make good decisions and master the habits related to those, then it’s very hard to not have better outcomes. So in that way, it’s not that it’s easy, but I like that it simplifies what the task of self-improvement is. It’s also about making good decisions and then building better habits. [00:11:37] MB: I think that’s a great framework, and I want to get into the decision-making piece of that. But I want to kind of save that for later on in the conversation and come back to or dig into more of this, this kind of idea of habit formation, because I know you've obviously written a tremendous amount about that and your new book is focused primarily in kind of the habits side of the equation. To start with, one of the things I know you've spoken about in the past is this idea of getting sort of 1% better every day. Can you share that philosophy or that sort of idea and where that comes from? [00:12:06] JC: Sure. So the book is called Atomic Habits, and the reason I chose the word atomic is because there are two things that I think make a habit powerful. So the first is it needs to be small, and obviously an atom is like the smallest fundamental unit of a compound, the smallest fundamental unit of a thing. They need to be small, because small habits are easy to start, easy to stick with, and we can get into that more about why it's so important to start small. But it's not just any small habits that really makes a big difference. It’s not just any kind of 1% change. It’s only when 1% changes compound and build on each other that they become something more powerful. An atom is like the smallest fundamental unit of a larger system. That's the piece of a molecule. In the same way, a small habit or 1% improvement needs to be a piece of a larger system within your life for achieving self-improvement or achieving results in sports, or music, or school or whatever it happens to be. So in that way I think atomic is a great phrase for it, because it's not only small, but it's also powerful, and that's really what we’re looking for here when we’re trying to build better habits and achieve improvement. You asked about why 1% change, why is that crucial? I think it's because habits are like the compound interest of self-improvement, and you can see this in many different areas of life. Productivity for example, being slightly more productive and getting 1% more done each day or getting an additional task done each afternoon, it doesn't really count for much on any given day, but over the course of a 30-year, that can be a really big difference. Same way with pretty much any of these strategies for habits compounding, they not only can work for you, they also can work against you. Negative thoughts compound, for example. Once you get in the habit of seeing people as a mean, or vindictive, or vengeful, you can see that behavior anywhere. You start the spot evidence of it all over the place. That’s where you’re primed to look for. Then once you see more evidence of it, you start to believe it more and it just becomes this downward spiral rather than an upward spiral. So in that way I think because habits are so powerful and have this tendency to be the compound interest of self-improvement to escalate or crash based on which side of the equation you’re on, it becomes particularly important to learn how to master those. The phrase I like to use is habits are a double-edged sword, and so it makes it incredibly important to understand how they work so that you can avoid the dangers half the blade, because if you know how they work, then you can get them compounding for you rather than against you, and that I think is why 1% improvement is kind of a good way to encapsulate the power of habits have over our lives. [00:14:44] MB: There’s couple different things I want to dig into around this idea. I definitely want to talk about how we sort of determine which habits have the potential to compound effectively, but before we get into that, tell me about the idea of the aggregation of marginal gains and why compounding is so important and how sort of tiny shifts can actually create massive outcomes down the road. [00:15:07] JC: Sure. The aggregation of marginal gains, the phrase that comes from Dave Brailsford, who’s the performance director for Team Sky, which is a professional cycling team in Great Britain, and in the early 2000s, he was hired and they had a very mediocre team at the time. They won a single gold medal, I think, back in 1908, and they had never won a Tour de France. It’s like the race thing around for like almost 100 years. So he was hired to change that, and his strategy, his kind of core philosophy as a coach was this concept that he called the aggregation of marginal gains. The way that he referred to it was like the 1% improvement in nearly everything that we do. So he started by looking at a bunch of things you would expect the cycling team to look at, like they put slightly lighter tires on the bike. They figured out how to use a more ergonomic seat. They have their riders wear these electrically heated over shorts to kind of keep their muscles warm while they were riding. They asked each rider to wear a biofeedback sensor so they could see how they responded to training and adjust their workouts appropriately. But a lot of these things are things that other professional cycling teams are looking to do as well. So then they did a bunch of stuff, a bunch of 1% improvements that you wouldn't expect the cycling team to do, like they hired a surgeon to teach the riders how to wash their hands to reduce the risk of getting a cold. They went to a wind tunnel and tested different fabrics in it to see which type of fabric led to the most aerodynamic ride and they have their outdoor riders switched indoor racing suits, because they ended up being lighter and more aerodynamic. They split tested a bunch of massage gels for muscle recovery to see which one led to the best form of recovery. Then one of my favorite ones is they figured out the type of mattress and pillow that led to the best night sleep for each rider and then they brought that on the road with them to hotels for big competitions. So Brailsford’s philosophy here was that if we can actually do this, if we can execute on all these little 1% changes, then I think we could win a Tour de France within five years. That was kind of the challenge the he laid down to the team. He ended up being wrong. They won the Tour de France in three years and then they repeated again the next year with a different rider, and then they had one year where they didn’t went in and then they’d won two more in a row after that. So won four out of the next five years after they implemented this. Then with an even larger set of riders, when they went to the Olympics in London in 2012, they won 60% of the gold medals available. So this idea that small improvements are not just like a cherry on top of your performance, but actually can be the thing that separates you from being mediocre to being truly great. That I think is something that's kind of hard for us to conceptualize. We don’t often think about how small habits make a difference in either direction. It’s very easy for us to dismiss a small bad choice eating a cheeseburger rather than a salad or something like that, or choosing to not study for 20 minutes rather than sitting down and studying tonight. But it's only a year or two, or five years later that the full impact of those small 1% choices and little changes ends up revealing itself. You don't realize how much your previous choices made a difference until they have time to compound, and that's really a principle that is central to any type compounding. You always use compound interest graphs for finance that they stay relatively low and small in the beginning and then it's only in the last like 10 years that they multiply it to some crazy degree and you’d become a millionaire. Warren Buffett, a classic example, one of the richest people in the world now, but he wasn't a billionaire until he was well into his 50s, which seems almost impossible given that he’s worth like almost a $100 billion now, but it's all been late in his life that that curve has escalated. This is something I call the plateau of latent potential. It's this idea that very early in that curve, it’s still really low. It kind of feels like you're stuck on a plateau and it's kind of – I like to use the metaphor; it’s analogous to heating up an ice cube. Say you’re in a room and it's cold. You can see your breath. Ice cube sitting on the table and it's like 25°, and it goes up 1° to 26, the ice cube is still there, nothing. 27, same thing. 28, 29, 30, 31. Still ice cube on the table. Nothing has changed. Then you get to 32 and suddenly the ice cube melts. You hit this phase transition. But it's not just because of this 1° shift from 31 to 32, it's the same as all the other shifts before it. So what happened? It's actually because you were accumulating this latent potential in the shift from 25 to 31° and all of that work was not wasted. It was just being stored. I think so often in life we feel like our work is being wasted early on, whether we’re trying to lose weight and we don't see any results, or trying to build a business and sales aren’t coming in yet, or trying to learn a language and it doesn't quite click. It feels like we’re not getting anywhere, but actually that work is compounding. You’re just kind of stuck on this plateau for the time being, and then it's only later, if you stick with, that actually see how much all that previous effort counted for. So this philosophy of marginal gains of making 1% improvements, it often won’t impress you in the moment on any given day, but it ends up leading to very powerful results in the long run. [00:20:23] MB: It’s such a great story, and I think really clearly kind of demonstrates that as you put it, these seem like sort of extraneous little extra things, but they really are at the differentiator between winning and losing, the differentiator between getting the results you ultimately want to achieve and kind of feeling stuck and feeling like you can't make progress. [00:20:42] JC: If you think about it, that’s really just what our days are. I mean, it’s a collection of individual moments like that, a collection of 1% choices. So if you can win those little battles, you end up winning the bigger ones in the long run. [00:20:55] MB: I think the other pieces too, and you touched on this a little bit, is this idea that people kind of get caught up in this illusion that there's going to be like a rapid change or transformation or that there is this one sort of secret strategy or thing that's just out of reach, and if they could just figure out that one trick, that one sort of hack or shortcut that that's the thing that's holding them back. In many cases, that's almost sort of the opposite of what's true. [00:21:21] JC: Yeah. I mean, there’s nothing surprising about the fact that we want faster results. I mean, who doesn’t want that? This is kind of, to be honest, a little bit of the purpose of science, is we’re trying to figure out what actually works that we stop wasting our time on things that don't. So it's a good quest to want to do things more effectively or to get results faster, but there's a negative side to it, which is we leap for any strategy that promises immediate, or rapid, or quick rewards, any kind of get rich quick scheme that’s applied to really any industry. I think, in reality, it changes usually even when it looks bit, even when it looks like an overnight success. It's like two tectonic plates grinding against each other on your surface. So for years, for probably hundreds and millions of years, they’re grinding and pushing and there’s work being put in and it doesn't really show up as anything. Then one day suddenly an earthquake happens, and it seems like this one event came out of nowhere, but really it was the millions of years of grinding that happened before it that led to the release of this major energy. I think this is true for almost any field of life that you have to be willing to put in a long amount of work for there to be a release of some kind of performance. The San Antonio Spurs, great NBA team, won five championships. They have a quote in the locker room and it goes something like, “Whenever I don't feel motivated to continue working, I think about a stone cutter pounding on a stone a hundred times and then it splits at the 101st, and first and I know that it was not the 101st swing that did it, but all those that came before.” It’s kind of that same idea. This a little bit of a victim of – Like we are a little bit of a victim of this like 24-hour news cycle that we have created. The only things that get covered on the news are events and events that are newsworthy. So it's only the earthquake or the splitting of the stone that is worthy of talking about. Nobody is going to make a news story about somebody hitting a stone for the 37th time and not happening. So because we only hear about results and hear about successful all the time, I think we get wrapped up into thinking that it's all about results, or it’s all about success, and we become invisible and blind to the process that hides behind it. Really, of course, it's always the process that leads to the outcomes. So my book tries to pull us back to center a little bit, help us realize that the process is the thing that we need to focus our attention on and then talk about how do we build a system so that process happens each day, rather than just hoping that we’ll feel motivated to do it. [00:23:57] MB: I definitely want to get to the kind of the motivation side of the question and the idea of sort of hoping that we feel motivated. Before we dig into that, I want to circle back to this notion of determining kind of which habits have kind of that potential to compound over time. How do you think about evaluating habits or determining which ones have that sort of power or that latent ability to be habits that can get 1% better every day? [00:24:22] JC: Yeah, that’s a good question. Well, I guess there are two ways to think about it. The first is you can think about the results of the habit itself delivers. So, for example, doing a push-up each day is going to lead to some form of muscle growth, and if I can continue to increase the number that I do from 1, to 2, to 10, to 20 and so on, then there should be some kind of games that are coming from that habit itself. But then there's also a second way to look at it, which is your identity compounds as you develop evidence for being that type of person. So each time that I do 10 push-ups, I'm not just getting my body in shape. I'm also casting a vote for being a fit person, or I'm providing a signal to myself that I'm the type person who works out, or I'm the type of person who doesn't miss workouts, that kind of thing. In the long run, I often find that accumulating evidence for a particular identity is actually the more powerful approach, and I'll get into that in a second. So I think that the answer to your question is what I asked myself is; does this action cast a vote for the type of person that I want to be, or the type principles, the type of values that I want to stand for? If it does, then I think it's worthy of trying to do each day and like let those effects compound, because it’s not only about the results that individual habit provides, but also about what it represents or who it represents myself becoming. For example, if you go to church every Sunday for 20 years, then you believe that you’re religious. If you study Chinese every Tuesday night for 20 minutes, you believe that you are studious. Your actions become evidence for the type of person that you believe that you are. Eventually, it becomes this kind of like two-way street. It's a feedback loop, which is the hallmark of pretty much any habit, is that they don't happen just in like a sequence. They happen in like a loop. They end up strengthening or weakening themselves depending on the feedback that you’re getting. So as you start to develop or adopt this aspect of your identity, then it becomes a reason for you to repeat it in the future. Once you see yourself as religious, it becomes a reason to go back to church every Sunday. Or once you see yourself as studious, it becomes a reason to study again and try to get a good grade in the next test because you got one on the last one and so on. I mean, it's a signal of an identity shift of believing something new about herself and once you believe that, it doesn't really feel like work to do that anymore, it's just like, “No. It’s not work. It’s just who I am to meditate,” or “It’s just who I am to not smoke,” for example. Anyway, I think that that's a powerful way to think about that challenge of; is this a habit that is helping me or not? Is this a habit that I should focus on? Does it cast a vote for the type of person I want to become? [00:28:00] MB: I think that's a really, really insightful way to kind of think about it and looking at habit selection through this sort of lens of identity creation. I mean, it kind of harkens back in some ways to sort of the commitment and consistency tendency that Cialdini writes about in Influence and obviously there’s a lot of psychology research behind it. This whole idea that you start to kind of – Once you make a decision, your sort of self-image starts to reinforce, “Okay. Well, I’m the type of person who does that,” and then eventually that becomes part of your identity. So to adopt the identity of being a voter, rather than to talk about the action of voting, it’s actually more powerful to adopt the identity. I think it does probably have some connection to the commitment and consistency idea that once we state a claim for being a type of person, we end up looking for ways to reinforce that claim. We don't want to conflict ourselves. We don't want to have some type of internal struggle. Often, a lot of the most painful problems, not only for individuals, but also organizations and teams, is some form of identity conflict. The team, or the business, the brand wants to stand for one thing, but the individual feels like they don't stand for that. Or you say you're one type of person, but then you’re faced with a situation where you have to act in a different way. This type of identity conflict can lead to some real challenges. So whenever possible, we want to avoid those challenges. We want to find ways to be in alignment with the identity that we have adopted, and you can imagine how that shapes our behavior in the long run. Once you adopt an identity and say, “I am a Yankees fan,” or “I am a cross-fitter,” or “I'm a vegan,” or “I'm a democrat,” or “I am a republican.” All of these things become evidence of reasons for you to act in a particular way once you've adopted that set of beliefs. [00:30:04] MB: This week’s episode is brought to you by our partners at Brilliant. Brilliant is a math and science enrichment learning tool. You can learn concepts by solving fascinating challenging problems. Brilliant explores probability, computer science, machine learning, the physics of everyday life, complex Algebra and much more. They do this with addictive interactive experiences that are enjoyed by over 5 million students, professionals and enthusiasts around the world. But one of the coolest things that I really also like about Brilliant is that they have these learning principles and two of them in particular really stick out to me as powerful and important principles. One of them is that learning is curiosity-driven. If you look at some of the most prolific thinkers and learners in history, people like Leonardo da Vinci, Albert Einstein, they were incredibly curious individuals, just really, really curious. It’s so great to see that one of their learning principles is this principle of curiosity. Another one of Brilliant’s learning principles that’s absolutely critical is that learning needs to allow for failure. If you look at Carol Dweck, if you look at the research behind Mindset, this is one of the cornerstones of psychology research. You have to be able to fail to learn and improve. You have to be able to acknowledge your weaknesses. You have to be able to push yourself into a place where it’s okay to make mistakes. These learning principles form the cornerstone in the foundation of Brilliant. It’s such a great platform. I highly recommend checking it out. You can do that by going to brilliant.org/scienceofsuccess. I’m a huge fan of STEM learning and that’s why I’m so excited that Brilliant is sponsoring this episode. They’ve been a sponsor of the show for a long time and there’s a reason; they make learning math and science fun and engaging and exciting. You can get started today with Brilliant by going to brilliant.org/scienceofsuccess. That’s brilliant.org/scienceofsuccess. If you’ve been enjoying our weekly riddles in Mindset Monday, we’re also collaborating with Brilliant to bring some awesome and exciting riddles to our Mindset Monday e-mail list. [00:32:12] MB: Another thing that I think I know you’ve kind of written and talked about in the past and aligns with this whole idea of sort of casting votes every day for the identity that you want to move towards is the notion of never missing twice. Can you talk a little bit about that? [00:32:26] JC: Yeah. With any habit, the key is consistency, and you need to repeat a habit enough times not only for the neurological pathways in the brain to be strengthened and for that action or that skill would become fairly fluent, but also enough times for you to believe it, for you to think this is like the kind of person that I am. What I realize, the more that I study people who are lead performers, or top athletes, or top musicians, or top artists, is that they make mistakes just like everybody else. It’s not that they’re really that they’re flawless in some say, but the key is they get back on track more quickly. So the phrase that I like to use is never miss twice, which is that if you find yourself falling off course, is you’re supposed to workout Monday, Wednesday, Friday and you miss your Wednesday workout, well then all of your effort and intention should go into getting back in the gym on Friday, because what you don't want is it’s never really the first mistake that ruins you. It's always the spiral of mistakes that follow it. Making one mistake is not really a big deal in the grand scheme of things. Missing the Wednesday workout doesn't mean a whole lot if you’re back in there on Friday. But many people find that they kind of adopt this all or nothing mentality with their habits. This is especially true with dieting. People feel like, “Oh, I need to stick to this diet,” and then as soon as they slip and don't follow it to some degree, they feel like the whole idea has brown for some reason, or it’s almost like we think either I should just do what I normally do, or I should follow this diet seven days a week. If I follow this diet only three days a week, well then that couldn’t be useful. Which soon as you state it that way, it sounds ridiculous. Like eating healthier three days we probably would serve you, but for some reason we convince ourselves of these things and it becomes easy to let one mistake spiral into many more, and never miss twice is a nice little strategy that kind of helps keep you on track. If you screw up your dinner that night and go off track and binge eat, then make sure that you get back on track and have a healthy breakfast in the morning. If it’s more about holding yourself back on track quickly, it doesn't really matter if you fall off the wagon if you get back on fast. If takes you a while to get back on, then suddenly you build a new habit of not doing the right thing rather than getting back on track with the habit you're actually trying to build. [00:34:38] MB: Yeah. When you sort of rephrase it and kind of reframe it that way with the dieting example, it makes it so clear that there's no reason to kind of throw everything out just because of one mistake. [00:34:48] JC: You’re not even really looking to be perfect. I mean, this is one of the things that I think is valuable about the 1% philosophy, which is if you could just eat one meal healthier each week than you are now, then that is an improvement. If you can do – It comes back to my point about evidence, which is a lot of people need evidence or a reason to believe that they’re even capable of change. So many people have tried to change or tried to make improvements and it hasn't worked out, that now they believe that it’s like not for them or something, that they somehow aren’t capable of doing it. But if you can stick to just one better meal each week, well, then you have a reason to believe that you could stick to two and you can kind of escalate and improve from there rather than trying to go straight from 0 to 100 and hope that somehow you could like radically transform your life or transform your results. [00:35:37] MB: Another thing that I think is a really critical point that you talk about in sort of habit formation is this idea that it's kind of dangerous or incorrect to wait until you feel motivated to do something. [00:35:49] JC: Yeah. Motivation is interesting. So researchers can track motivation or desire. We want to call that – In the book I call it craving, and I define a craving as a desire to change your state. So pretty much every movement, every choice that you make is driven by the desire to change your state, at least to some small degree. It might not even be conscious that you’re doing that, but you want – You’re in a particular state right now and you want to be in a different state. So you walk into the kitchen and you see a plate of cookies and you envision what it would be like to eat that cookie or that you would feel better or that it would be tasty. So you recognize, “Oh! I’m in a current state that does not involve cookies. I would like to be in the future state but does involve cookies,” and that's the gap between current state and your future state is your level of motivation or desire. When that gap is wide enough, you take an action. So that is true, but it also fluctuates. So you can – Scientists can track the level of motivation or desire based largely on dopamine levels in the brain. I want to throw a caveat in here and say that dopamine gets talked about a lot. It's not the only aspect or only molecule that plays a central role in habit formation or in behavior, even though sometimes it gets talked about in this kind of all-encompassing way. But does play a central role, and so I think it’s worth talking about or worth using as an example. Anyway, dopamine is constantly circulating throughout the brain. But the levels change based on circumstances and situation based on the cues that you're picking up. So when you see a cookie, for example, then dopamine might spike and that spike leads to a rise in desire, or rise in motivation and gets you to act and you go and pick the cookie up. This is true for all kinds of habits. There is one study that showed cocaine addicts a picture of cocaine but only for 33 milliseconds, which is actually too short to consciously know that you have seen any yet still there was a rise in dopamine and desire. Anyway, the body is continually picking up on different stimuli in the environment and recognizing what's going on. Depending on how attractive a particular stimulus is, the level of motivation and desire in your brain rises or falls. Well, you can already see that there's some kind of issues here, especially related to habits, which is that a habit, by definition, is something that you do repeatedly and do consistently, and motivation, which we just described, is something that rises and falls. So why would you want something that you need to do consistently to rely on something that is inconsistent? So this is the challenge with picking a habit that requires a lot of motivation, which is that high dopamine levels and a lot of motivation are only going to be there every now and then. So you're faced with this situation where either to do something really difficult, you need to make sure that it happens at a time of day when your motivation is always high, or you can rely on it to be high, or you need to scale the habit down so that it's so easy that you can do it even if your motivation is low. The second approach I think is the more effective one, which is that a habit should be so easy that you should be able to ask yourself the question, “Can I do this habit 98% of the time no matter the conditions without fail?” If you can't answer that question, then you're probably starting too big. This is a surprising thing for a lot of people. Even when you know that you should start small, it’s still really easy to start too big. So if someone talking about building a habit of going for a run each day, well they might say, “Well, I should start small. So let me only run for 10.” Actually, even that is still way too big. What we’re talking about here is like the habit should be getting your shoes on. So tying your shoes is the only thing you're focused on. Once you get your running shoes on, then you just get out the door and let it go from there. Whether you run or not, whether you actually even take a step, is not the goal. This sounds kind of ridiculous, but it makes more sense when you understand the impact that habits can have on your daily routines and kind of how behavior works in general. So there's a story that I tell in the book about Twyla Tharp, who’s a famous choreographer and dance instructor, and every morning she works out for two hours, which sounds like this Herculean feat, this really impressive habit. But she says that the habit is actually not going to the gym. The habit is she wakes up, she puts on her workout clothes and legwarmers, walks outside and hails a cab at the corner of, I think, it’s 91st Street in 2nd Avenue or something like that. Then the habit is she hails the cab, as soon as she hails the cab and gets in the cab, the habit is done, and then she knows that the workout just kind of follows naturally, but she doesn't really worry about the workout itself. She worries about hailing a cab. That I think is a great example of the impact that habits play in our daily lives. So depending on what research study you look at, habits are defined to encompass about 40% to 50% of our daily behaviors, which is a lot. Things that you don't think about, like brushing your teeth, or tying your shoes, or whether you scratch the side of your face while you’re talking to somebody, or cover your mouth when you laugh or stuff like that. Nobody thinks about all these little habits that are filling up their day. But I would argue that the true impact of habits is far greater than that for the simple reason of the example I just gave with Twyla Tharp, which is that little habits are like an entrance ramp to a highway. They’re like a fork in the road. They determine what we end up doing consciously for minutes, or even hours afterward. If you take the habit of pulling your phone out of your pocket, you pull your phone out, you’re standing in line at the supermarket or something like that and you can be staying in line for five seconds and we’re like, “I need to be doing something. I’m bored already.” So we pull our phone out, and that action only takes two seconds, but the action of doing that ends up determining what you spend the next 10 minutes on. Are you playing a videogame? Are you answering email? Or checking social media, and all those things are more conscious choices. You might think carefully about how to respond to a particular email, or think carefully about how to beat this particular level of a videogame. But the habit of pulling your phone out shaped the set of options that you’re facing and what you’re paying attention to. So I like to call that a decisive moment, and a decisive moment, there's usually – I would say for my day, there’s quite 5, maybe 8 decisive moments throughout the day. They kind of determine how I spend the next hour or two that follow. So, for example, in the evening, around like 5:00, 5:15, my wife gets home from work and either we change into our workout clothes and then go to the gym, or we sit on the couch and watch The Office reruns or eat Indian food or whatever, and it's really that like brief moment where either we change into our workout clothes or not. That little habit, that decisive moment that determines what is going to happen in the next two hours. If we can master that moment, then all the other stuff, like we’re going to get in the car, we’re going to drive in the gym, we’re going to step under the bar and do the workout. All of that doesn’t even really require that much motivation because you’ve already kind of set the path in motion. So bringing it back to your original question about motivation and how it fluctuates and how it works and whether we need it to stick to habits, I think it's far better or more effective to focus on mastering a few of these decisive moments throughout the day that end up shaping how you spend the next hour and making those decisive moments as easy as possible, requiring as little motivation as possible, because once you do that, then you find that good behaviors often falls naturally. So I think one of the other major factors that often gets ignored in the habit conversation is the importance of social norms. Can you tell me a little bit about how those kind of impact and shape our behaviors and habits? [00:43:49] JC: Sure. A social norm is like a collective agreed upon belief by a group or a collection of people. For example, in many cases, these are just implicit. We don't even really talk about them, but like you step on to an elevator and everybody turns to face the front rather than facing the back. If you have an interview, you wear a suit, not workout clothes. Now, there's no reason that you have to do these things. You could show up at an interview in workout clothes, but you would be judged, it would be weird, because it violates the social norm. It violates the kind of collective agreement about how we’re supposed to act in a particular situation. Much more than we realize, these social norms, these kind of implicit agreed-upon beliefs shape our daily habits and behaviors. The key for making them work for you rather than against you is that you have to realize each tribe, each little subculture or subgroup, has a set of norms that are associated with that group. Take crossfit, for example. Crossfit has a set of norms. You don't call the gym a gym. You call it a box. You don't call the workout a workout or an exercise, you call it a WOD, workout of the day. They have this kind of like shared language about how they approach it. Then there's all these other kind of implicit things that it means to be part of the culture. If you decide to join a crossfit gym, then you might start eating paleo, for example, or you find yourself buying knee sleeves, or wrist straps, or different types of weight lifting shoes. Partially, because you need those things to do the workout, but also partially because having that stuff and talking in that is what it means to fit in with that group. This is a very deeply wired trait for all of us. We want to fit in with the group because we want to belong. From an evolutionary standpoint, it was really valuable to belong. We lived in tribes of hunter-gatherers. If you were abandoned, if you didn't belong to the tribe, then that was basically a death sentence on the savanna. So we’re deeply wired to signal to provide indications to the rest of the people around us that, “Hey, I'm part of this group too.” So we look for ways to do that, and the key is that we look for ways to signal that we belong when we want to belong to that tribe, when we want to be part of that friend group. So this is I think is – This is kind of the powerful punch line, is that you need to find a group where your desired behavior is the normal behavior. That's the first part. For example, getting in shape. Working out seems like a hassle to a lot of people. It seems like a lot of work, but there are many people who that is just normal for. Going to the gym is just a normal thing. It’s not something that requires a ton of efforts. It’s part of their identity as we talked about earlier. You're looking for a group where your desired behavior, the thing that you want to achieve is part of the normal behavior. But then the second part of that is that you're looking for a group that you also share some type of context with, that you could already be friends with. One of my favorite examples, my friend, Steve Camp, runs a website called Nerd Fitness. So it's all about fitness and getting in shape, but for people who love Star Wars, or superheroes, or Batman, or Legos or stuff like that have like some kind of nerdy interest as well. So if you're the type of person who loves Star Wars and you feel kind of out of place in the gym, well, making friends with people who are in Nerd Fitness is perfect, because now you have a reason to be friends. You have a reason that you want to belong to the group, that you want to prove to them, “Hey, I'm into this too,” and all of these new people that you’re hanging out with now are also into the thing that you want to achieve, the desired behavior for you is part of their normal behavior already. That's a really powerful way to change, because you have a reason to connect, a reason to belong and you naturally start to soak up some of the social norms, or some of the typical behaviors of that group and culture. [00:47:38] MB: That makes a ton of sense. I mean, that kind of simple idea that you’re sort of the average of the five people you spend the most time with. It's thrown around a lot, but it's actually something that's kind of backed by the science and the evidence around what shapes human behavior and what shapes our sort of expectations and intentions and ultimately our habits. [00:47:57] JC: I mean, social norms are incredibly powerful, so much so that they're almost invisible to us. You can think about the type of school system that you grew up in, or the type of neighborhood that you grew up in. I mean, if you move to a new neighborhood, and then on Tuesday evening everybody sets the recycling out, then you look around and you’re like, “Oh, I guess I need to sign up for recycling. That’s what people like us do here,” because you want to fit in with the rest of your neighbors. Same reason why people like trimming their hedges and mow their grass. There's no reason you have to mow your lawn, but you do it because you would be frowned upon by the rest of the neighborhood if you were the sloppy one. So there are so many things that we do like that, from the religions that we practice, to the schools that we go to, to the way that we act in conversation, whether or not we buckle up our seatbelt, or whether we smoke inside, or adhere to the laws and don't smoke. Laws and regulations are just a way of formalizing a social norm, formalizing something that we largely, not always, but largely have agreed-upon that this is the way we [inaudible 00:48:52] particular situation. Yeah, in many cases, those social norms end up shaping our behavior in very meaningful ways. [00:49:00] MB: So what's kind of – For somebody who wants to apply that, how do they sort of seek out or find people who have those social norms that will get them the habits that they want? [00:49:09] JC: Yeah. It’s a good question. I don't think it's that hard to find people who are achieving the thing that you want to desire. Pretty quick Google search could probably find you people who are – If you want to run a million-dollar business, you can just search for groups of entrepreneurs who do million+ in revenue or whatever. It probably isn't that hard to find that. What is harder is finding people who have achieved that, but you also have something in common with you now. For this, I think this is one reason why it's crucial to have hobbies or to have a variety of interests to be curious about multiple areas, multiple things, because it gives you more hooks, more surface area to connect with people on. So the more things that you're curious about, the more opportunity you have for making those connections between the people that are already achieving what you want to achieve and the people that you have some kind of interest with, and once those Venn diagrams overlap, you’re like looking for that nerd section. [00:50:04] MB: I think that's a great point, and having that commonality, that sort of common thread is what enables you to connect with those people and ultimately bridges the gap between – Kind of forms the basis for that relationship that then lets you start to kind of transform your habits. [00:50:18] MB: For somebody who's listening to this episode that kind of wants to concretely start to implement some of the ideas that we've talked about today, what would be kind of a piece of homework or an action item or sort of a first step that you would give them to start implementing these ideas? [00:50:34] JC: I’ll give you two. So the first step is to downscale your habits until they can fit within two minutes. There's nothing magical about two minutes, but I call it the two minute rule and it’s just a good like sort of starting ground for figuring out if your habit is small enough. For example, like fold the laundry becomes fold one pair of socks, or do 30 minutes of yoga becomes takeout my yoga mat, or read a book every week becomes read one page tonight. So you're just trying to take whatever the thing is you're trying to achieve and you scale it down so that it’s small enough that you could do it within two minutes. Then the second piece is to reduce friction so that doing that behavior is as easy as possible. The most effective way to do this, to start, is almost always environment design. So let's take the reading example. If you want to build a habit of reading one page every night, then you could say, “All right. After I make my bed in the morning, I’m going to take a book and put it on my pillow so that when I get in bed at night, the environment is already primed. It’s there. It's ready. I can just pick the book up and read a page. So you can do this also for habits that you want to avoid. For example, if you – A common example I give is if you walk into pretty much any living room in America, all the couches and chairs face the television. So it’s like what does that room designed to get you to do? It’s designed to get you to watch TV. So if you can adjust that just slightly. You could take the remote and put it inside a drawer and put like a book in its place, you could put your TV inside like a wall unit or a cabinet so that there are doors that close it off and you don't see it as much. You could, after each use, unplug the television and then only plug it back in if you can say the name of the show that you want to watch out loud. So all of these are just little ways of increasing friction between you and the bad behavior. So I would say if you can do those two things, if you can scale your habits down to just two minutes or less so that they’re really simple and easy to start, then we’re talking about kind of that decisive moment, make the decisive moments as easy as possible. Then if you can redesign your environment to reduce the number of steps between you and the good behaviors so you’re reducing friction or increase the number of steps between you and the unwanted behaviors, so you’re increasing friction for the bad habits, then I find that those two things I think you'll find will make a bigger impact than you would think especially if you scale them. I mean, the collective impact of living in a room, or an office, or home where you've got 50 little environment design hacks that are all kind of nudging you toward the right thing and away from the unproductive thing, it’s much bigger than you would think. All those little 1% improvement add up. So I think both of those are very actionable and very good ways to start. [00:53:08] MB: Where can listeners find you and your work and your upcoming book online? [00:53:12] JC: Yeah. So the book is called Atomic Habits: Tiny Changes, Remarkable Results. You can find it at atomichabits.com, and we’ve actually put together a variety of bonus materials, extra interviews and downloads. How to apply the ideas to parenting? How to apply the ideas to business? You can get all of that additional material at atomichabits.com. So that’s probably the best place to go and check things out. [00:53:33] MB: James, thank you so much for coming on the show for sharing all these wisdom and knowledge. So many great kind of insights and ideas. It's been a pleasure to have you here. [00:53:42] JC: Awesome. Thank you so much for having me. I appreciate it. [00:53:44] MB: Thank you so much for listening to the Science of Success. We created this show to help you our listeners master evidence-based growth. I love hearing from listeners. If you want to reach out, share your story, or just say hi, shoot me an e-mail. My e-mail is matt@successpodcast.com. That’s M-A-T-T@successpodcast.com. I’d love to hear from you and I read and respond to every single listener e-mail.